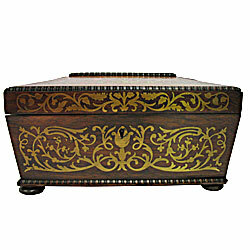 William IV Brazilian Rosewood Work Box with Brass Inlay, circa 1830-40. This lovely sarcophagus-shaped sewing box on bun feet, was suffering from structural damage to the timber around its hinges and had sections of veneer and moulding missing. The repairs to the hinges were followed by the careful replacement of veneers to match the original rosewood. The missing replacement bead and reel moulding was replicated by using solid rosewood, which had first been quartered and re-adhered with a release paper between quadrants, then turned to profile and finally split apart to produce quadrants of bead.